Sounds like a Roald Dahl novel, right? Unfortunately no. Hev Winter has lived on Caerphilly Road in Cardiff since 1994. She’s here to tell us about the plight of the residents and their ongoing battle against the Carry on Cardiff Council roadworks that have been carried out there. In brief, all their trees have been cut down and not replaced, accidents at the junction are at an all time high, wing mirrors are constantly swiped off cars, there is a bus lane that no bus can fit in – and the bill for all the work is now at £2.2 million … and rising! 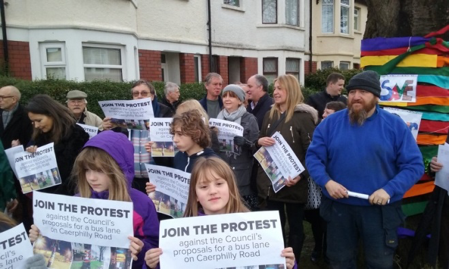 Read on for the plight of the Caerphilly Road residents … and how they’ve been taking action. You may recently have seen a number of features in the local news regarding Caerphilly Road in the Birchgrove/Heath area of Cardiff. Caerphilly Road, (A469), runs from the Gabalfa Flyover and heads north towards Caerphilly, stopping outside Morrisons in Llanishen where the A469 continues over Caerphilly Mountain. I have lived here since 1994 and am responsible for the ‘Caerphilly Road Concerns’ Facebook page which was set up in December 2015. I thought you may be interested to see what’s happening from a resident’s point of view. 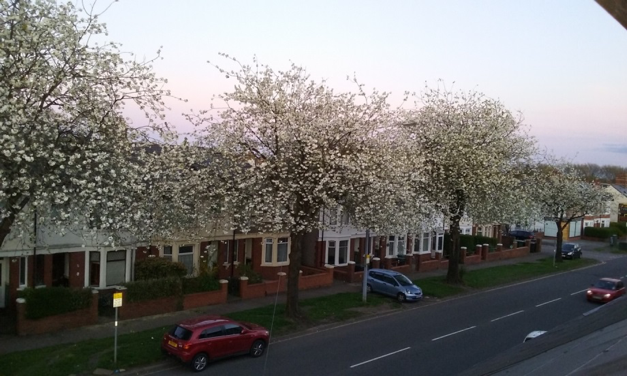 Until a year ago, the stretch of road from the Birchgrove pub to Lidl had 31 roadside trees, nine were flowering cherries which produced beautiful white blossom in early spring. Seven of the trees towered above the houses and we think they were probably planted around the time the houses were built in 1935. They were a defining feature of the road; when the wind blew, the falling blossom was like a snowstorm. Under the trees was a grass verge and a two lane road with parking down one side and restricted parking on the other. As it was – no problems – traffic flowed smoothly. In the run up to Christmas 2015 the council announced they were going to start work on the Birchgrove regeneration plan. They planned to re-pave the area by the shops, putting in a flowerpot or two, adding a bit of parking and a few other changes to bring more business to the area. This part was good and nobody had any issues with it. The problems arose further up the road where they wanted to create new parking for residents and put in a bus lane. They were going to cut down most of the trees for parking spaces and re-paint the existing two lane road in order to squeeze in a bus lane as well. Anyone with a scrap of common sense could see a bus lane wouldn’t fit, however, the council ‘experts’ were adamant it would. The sad day they cut this tree down March 2016 – you can see the old layout – this road was to be repainted with a bus lane without widening the road at all. The reason the bus lane had to go in was that the funding for the works was awarded by an EEC grant which was only given on the proviso that public transport links (i.e. a new bus lane) was a part of the plans. The council told residents they’d have parking bays, although they already had parking on the road. 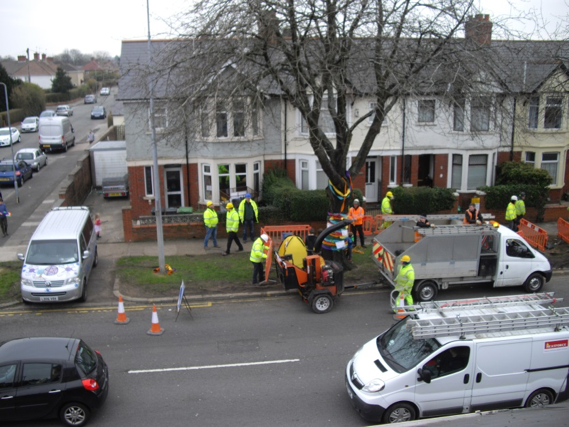 The residents were then allowed to park on the grass verges under the trees as a temporary measure until the work was done. This predictably trashed up all the grass and left a muddy mess. The residents didn’t like the mess and some were therefore eager for the work to begin. Sneaky! The council changed the plans many times and finally unveiled them at a public meeting one Thursday afternoon when most people were at work. The residents who attended were very upset and there were a lot of raised voices from the residents towards the councillors and planners. There were no trees or grass on the new plans and the residents firmly believed the bus lane would be a disaster. The planners and construction company who were there to show the plans were clearly overwhelmed by the level of anger of some of the residents. Residents protested and set up a petition against the works which reached 1659 signatures. With the help from the local Women’s Institute they dressed the trees in knitted and colourful scarves and jumpers to bring attention to the proposals. There was a lot of media coverage. The council ignored all of it and started work although they did promise the residents replacement trees and grass, providing when they dug up the road they didn’t find anything which would prevent new trees being planted. They said the new trees would have special root ball systems to ensure they too didn’t grow too big in the future and cause the pavement to lift. The residents had a sit down protest under the old trees. The residents set up a Facebook page ‘Caerphilly Road Concerns’ to keep people informed and so residents could have their comments logged in one place. We explained ourselves over and over to anyone who wanted to listen, and many who didn’t. Anyone with half a brain could see a bus lane would not fit properly onto the road. Once the bus lane was put in and each lane was made narrower there’d be no room for cars to filter around any car waiting to turn right, causing huge tailbacks. Cars turning right would be at risk as they wouldn’t see anything in the bus lane if there was a line of waiting cars on the opposite side of the road. Ambulances from the University Hospital of Wales further down the road, would be delayed as traffic would have no room to pull over. Cars coming out of side roads would sometimes have to pull into the opposite lane in order to turn. Also the trees drank lots of the rainwater – where would it go if the trees weren’t there? Would the removal of the trees cause damage to the adjacent houses? We went to the monthly council meeting in the City Hall in February 2016 to ask a public question. What would happen if two HGVs and a bus should pass on the same stretch of road? The council’s reply was, ‘All necessary measurements and assessments have been done.’ Hmmm. In March 2016 they started chopping down the trees. 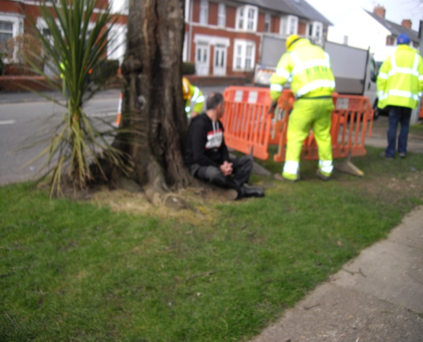 On the day our campaign tree was cut down they sent about thirty police officers to make sure residents behaved. We had no plans to tie ourselves to the trees it was pretty pointless by this stage. When they finished, only three of the 31 original trees remained. For a whole year the road was a total nightmare with roadworks, digging, mud, barriers, holes in the ground, piles of builders rubbish, temporary lights and general havoc. After – can you see the new trees? Finally the work was complete and they planted little sticks which were our ‘replacement’ trees. Since the work was ‘finished’ most of it has been either completely re-done within a few months or patched up. A total of £2.2m so far and every day they’re fiddling around with something – extending the width in one part, replacing the paving at another, shuffling a kerbstone. Some residents have unplanned water features in their front gardens because the new tarmac was laid over the drainage holes for their gardens. There were reports of a resident having a window shatter when workmen began drilling outside her house. One day they cemented 61 street-sign poles into the pavement every twenty metres or so along the whole stretch of road, nobody knew why, not even the workmen who said they were merely following orders. It looked like some form of carnival preparation. Two days later all the poles were cut down again and the holes cemented over – apparently someone had put them in at the minimum spacing rather than the maximum. Next, bollards went up at the corner of each side street and were cut down after six days with new ones put in a metre to the left. Nobody knew why. Finally the new bus lane was painted in and looked every bit as bad as anticipated. We watched the first bus try to drive in it. To nobody’s shock and horror – it didn’t fit! Residents considered investing in shares for a replacement wing-mirror company. Then this happened over and over, – cars turning right hit by taxis which were using the bus lane. Within weeks there had been a few cars written off exactly as we had predicted. There was a sudden increase in stationary traffic because again, as predicted, cars couldn’t filter around others waiting to turn right. 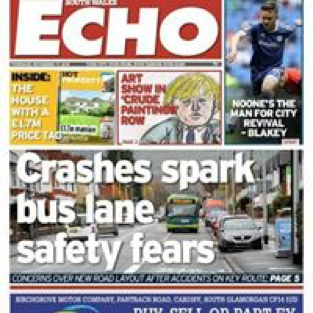 Bus drivers themselves admitted they didn’t like driving in the bus lane. If a lorry was on the road they were as good as stuck. People in the roads nearby started to complain about increased traffic trying to avoid the main road. Pedestrians got soaked as cars drove through the huge puddles on the porous tarmac. The pavements look like patchwork quilts my nan would be proud of. The bill so far is over £2.2 million and rising. 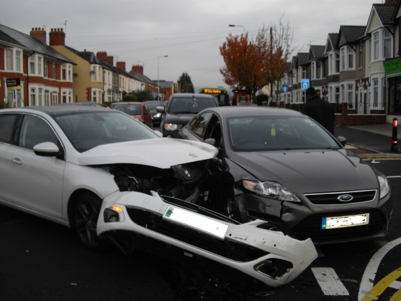 The council are considering stopping right hand turns or introducing a 20mph limit because of the accidents. Who knows, is this the most ridiculous road layout in Cardiff? Please feel free to visit our page and give us a like if you can! Hev Ward was born in Cardiff ‘a fair few years ago’ and attended Cardiff High School. She moved to Caerphilly Road in 1994 where she has lived ever since. A mother of three children aged 13, 11 and 11 (twins), she is also a passionate skier, bear maker, local volunteer for St John Ambulance and advanced motorcyclist. She loves writing and is a published author. In December 2015 she set up the ‘Caerphilly Road Concerns’ Facebook page with a neighbour. The page was a place where locals could get together to jointly fight for what was right for the road they lived on. The plans had already gone through consultation and been passed and the page was an attempt to ‘do something’ to avoid the disaster they believed was imminent. Since then the page has had a growing number of readers and is regularly updated.